Many grandparents are watching their grandkids in the daytime while a single parent or even both parents are working. So in effect, those kids have two sets of parents and two parenting styles to cope with, and those styles may not always be in sync. If the picture is that there’s a working single parent and that you are raising the child during the work hours, it’s very important that you and the child’s parents sit down and come to a common understanding of how you’re going to manage behavior, what the limits are, and the range of consequences that are appropriate. New situations will present themselves every day, and you may get frustrated from time to time and feel like you’re going back to the drawing board, but stick with it—it’s very important that all the adults in the child’s life are on the same page. The difficulty here is that grandparents don’t like to be told how to raise their grandkids, thinking that they’ve raised their own children and know how to do it just fine. And parents don’t want their kids to be raised outside of their own philosophy. This can become a point of conflict between grandparents and their children. Communication and a willingness to look and learn by both parties will prevent this problem from becoming a crisis. Children who are living with their grandparents because of parental addiction, neglect or abandonment bring a whole set of other problems to deal with. These kids are already programmed to deal with the negative environment they came from, and may not be ready to move into a family situation where there are boundaries and rules. What grandparents have to remember is, when your grandchildren move in with you, you are their new family. In my private practice, I knew many grandparents who raised their grandchildren because of parental neglect, abandonment, incarceration or substance abuse. Frankly, these grandparents had their hands full. Often their grandkids came to them with a constellation of inappropriate behaviors already firmly in place. It was very hard for these grandparents to try to change that behavior or intervene in the child’s life. And there are generational difficulties, as well as physical problems with caring for children when you’re older. Your energy levels and mental flexibility may not be what they were when you were parenting young children yourself. If the picture is that the grandparents are raising the child because of parental neglect, abuse or abandonment, above all, the parents should not be allowed to undermine the authority or rules the grandparents have put in place. You should limit or forbid visits until the parent is willing to comply with that. That’s because the grandparents have now become the primary parents, and the birth parents have to take a secondary role. It’s all too easy for the secondary parents to judge grandparents and be critical of their efforts, because it helps the birth parent not look at his or her own irresponsibility and neglect. But this should not be tolerated, especially in front of the children. The grandparents and the birth parent have to communicate, share thoughts and ideas, and then come to some method of operating together. I want to be clear: such meetings should not become a forum for birth parents to be abusive, oppositional or defiant to the grandparent. This is all too often the case. Grandparents should not accept blame from birth parents who have lost their ability to meet their own parenting responsibilities. When kids say “You’re not my mom or dad,” what they’re really trying to do is take the power away from you. Focus on what your role is: Caretaker. That means you should inform the child what the rules are in your house. The whole idea here is to avoid a power struggle. What your grandchild is doing is inviting you to a fight. And remember, you don’t have to attend every fight you’re invited to. Avoid the power struggle, and calmly state what your role is and what the rules are. It’s very important to verbalize no judgments about the mother or father. Judgments will only lead to more anger and resentment, which will lead to more power struggles. I want to add that I really admire and respect grandparents—or anyone who adopts or takes in a child who has behavioral problems. In my opinion, they’re amazing. But that doesn’t mean that you can do it alone. And just as parents need help, so do grandparents, and I urge you to get the help you need to successfully live with and raise these children. First of all, if your grandchild is being physically abusive to you, you should call the police. There’s no excuse for physical abuse. You did not work all your life to be abused physically in your later years. If you want to be a martyr and allow that, that’s your choice. But understand this: choosing to be a martyr doesn’t help the child. If you think you are doing it to help that child, what you need to understand is that the most important thing for that child is to have powerful limits set for them. And if they won’t accept the limits imposed by you, then you need to look outside the home for entities with more power, such as the police and the social service system. Often you’ll hear grandparents state that they don’t want to call the authorities because they’re afraid their grandchild will end up in group home or institution. My response is clear: if he’s physically hurting you, robbing you, or abusing you, maybe he needs to be in a group home or institution where the resources are available to teach him how to manage himself. I don’t say this to be harsh. I say it with complete empathy for your situation. The fact remains that kids who are physically abusive, steal, set fires, or destroy property often need more resources than the ordinary family has to offer. These behaviors should be taken very seriously indeed, because they can be precursors of much larger problems. If You’re Considering Taking in a Grandchild, Ask Yourself: Are You Able to Manage a Child with Behavioral Problems? In my experience, many of the grandparents I worked with were very committed to their grandchildren, but were in fact just plain tired. They had lived their lives, they had worked like dogs, they had raised their kids, and now when they were dealing with their own failing health and financial problems, they felt obligated to take on the burden of raising their grandchildren. While I respect the generosity of grandparents tremendously, I wouldn’t always advise people to try to manage a behaviorally disordered grandchild. Each case is different. Remember, if the kid is well-behaved and knows how to manage himself, accept authority and recognize limits, the grandparents can do fine. But behaviorally disordered children are not only draining, they require people who have acquired special techniques in order to manage them. Many of the behaviors grandparents have to address today were not part of the youth culture 30 or 50 years ago: The blatant disrespect, the demand for autonomy, the open defiance to rules. These things were present, but not at the level of intensity they are today. Grandparents I met in my practice often reported to me how shocked and discouraged they where when their grandkids did not accept their authority or the limits they set. 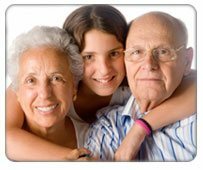 My advice to grandparents in cases where inappropriate behaviors start to emerge is to get help. That help can be outside the home in a counselor’s office, or that help can be inside the home through a training program like The Total Transformation. If these children have behavior disorders, you’re going to see all that goes along with that: manipulative behavior, risk taking, rigidity, senseless defiance. Remember not to blame yourself if these behaviors emerge: grandparents need as much help as anybody else in dealing with these issues.